Modern medicine has given us many great things that people couldn’t even imagine just a century ago. For all of its strengths and advancements, however, conventional medical science sometimes has no answers for suffering patients. Many patients with digestive disorders fall into this category, and for a number of those suffering, cannabis provides the only relief from their symptoms. Here are several diseases that are being treating with medical cannabis. Celiac disease impacts the small intestine after consuming gluten. The immune system will begin to attack epithelial cells in the small intestine, causing pain for the patient and the inability to absorb nutrients. Those suffering from celiac disease are more likely to develop diabetes, multiple sclerosis, and cancer later in life. Thankfully, cannabis can help. Research shows that cannabinoid receptors can heal damage caused to the intestinal lining in those with celiac disease. Because of this, researchers suggest targeting CB2 receptors in patients suffering from celiac disease. Many patients have experienced relief from their often wretched stomach pain and sometimes report being disease-free after medical cannabis treatments. Leaky gut is another gluten sensitivity related disease. An excess of gluten can create a substance called zonulin, which removes the binding of stomach cells. The resulting space between cells will allow food particles to leak through. Moreover, undigested food particles can even enter the bloodstream and cause infections, potentially leading to something much worse. Doctors will often prescribe patients with potentially harmful pharmaceuticals to help treat this ailment. Many patient testimonials suggest that cannabis can help heal the gut, which could bring much-needed relief. Crohn’s is a chronic inflammatory bowel disease that affects the lining of the digestive tract. Symptoms of Crohn’s include abdominal pain, weight loss, diarrhea, anemia, and fatigue. Studies have shown that cannabis helps with most of these, but many mainstream medical professionals fail to consider treating Crohn’s with medical cannabis. Instead, steroids and cortisone might be prescribed to help heal swollen colons, common among Crohn’s patients. These drugs could cause harsh side effects and can often make a patient’s condition worse. Patients might not be aware that cannabis can help them. Evidence and empiricism will continue to educate the masses. 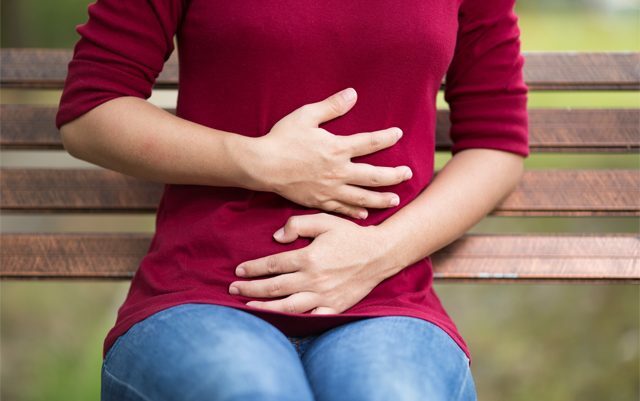 Thankfully, many patients in legal states have access to relief in the form of medical cannabis, but far too many often still face harsh penalties for daring to treat their digestive ailments in such a way. Do you or someone you know have a stomach or bowel disorder that was treated with medical cannabis? We want to hear your story. Let us know in the comments. This article is for entertainment and discussion purposes only and is not intended to give medical advice or to address the treatment of any disorders. My son was 15 when diagnosed with Crohn’s. He is now 18 and it has been a constant struggle. This disease changed every aspect of his life. It effected his personality, his education and his love of playing baseball. He was on several medications, which sometimes worked but inevitably caused other side effects. We live in Florida and have not had access to medical cannabis. He has been using CBD oil for about a year and it is the only thing helping him. Finally Florida has passed Amendment 2 and we will soon be able to get him what we believe he needs. I was diagnosed at age 9 with IBS-D. It impacts most everything in my life. My ability to hold down a job (missing work due to being sick), being able to sleep, have to be so careful what I eat. In addition, I have a gluten sensitivity, and eggs break me out in hives. When I was young, I called the horrible cramps I had on an almost daily basis, “The Ickies.” When I was in my teens, I started smoking mj..and one of the first things I noticed was how it got rid of “the ickies”, the cramps would just magically melt away and I could feel normal. So whether it’s legal or not, nobody better try to take away my medicine. Cannabis cured my Diabetic Neuropathic Gastroparesis caused from Federal & State approved and paid for Methadone Maintenance. Six years after moving from Iowa to Colorado and giving up Methadone for Cannabis I’m going on ten months without a Gastroparesis attack. BTW this was done by me only. No doctors knew or were legally able to tell me about marijuana treatments. FYI I am a 63 yr old male. Do you have a drug study for treatment of ulcerative colitis? UC is similar to Chrons and I have been on all of the treatments for UC and my body did not respond to any of them. I have heard that marijuana can help with the pain and nausea. I have been sick for four years and am desperate for help.